This post briefly explains how to bind Visio diagram, exported as HTML to some external live web-service. It’s based on the HTML/SVG export extension. If you want the exported diagram to be connected to some live data, you’ll need to connect to some live service (in this example, we consider a REST service). In the following posts, I’ll discuss binding a diagram to a SharePoint list using JSOM / REST. 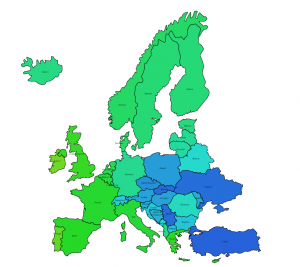 Grab a Visio diagram, showing a Europe map. There are many (well, at least some) available. You could take, like me, simply an SVG file from Wikipedia, or you can check out the map from VisGuy, or just take stock Microsoft maps. Add extra information for the diagram you want (in our case, I’ve added capital names as shape data). The reason to go for capitals, we need some particular point to get weather for. Capital looks like one that fits. 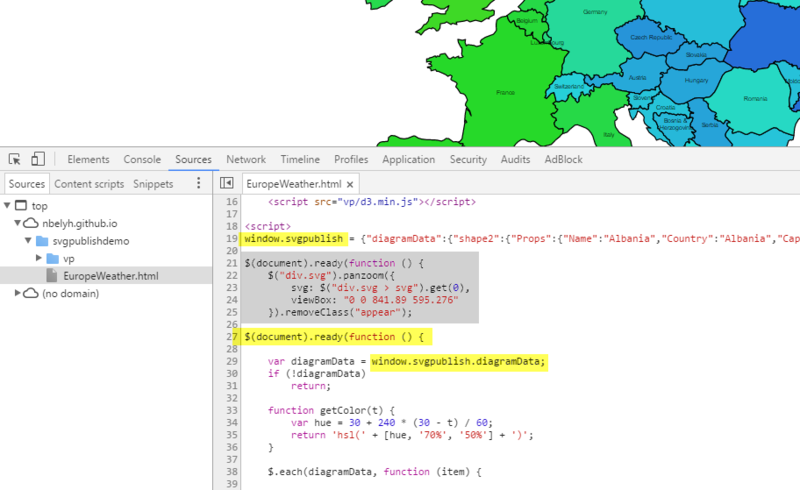 EuropeWeather.zip Sample diagram, demonstrating binding html-export to a live weather service. As a first step, let’s turn off (uncheck) all basic services, so that they are not in the way. I’ve described those in the previous post. To get the understanding of how that code gets into result page, we can check it directly in the browser, hitting F12. You can see that the addin stores for you all “shape data”, and other information (like shape hyperlinks and connection information) in variable “svgpublish”. This variable can be used that variable to access the diagram data, but we’ll use it just to enumerate top-level shapes, which are relevant for us. "Temperature: <b>" + data.main.temp + "</b>"
What could be the cause of this? I have tried to compare my HTML file with the EuropeWeather sample file, but I cannot see any significant difference.